In the context of a great game with Russia, the emphasis on Ukraine is understandable - it had been the 2nd most powerful Republic in the USSR and its agricultural heartland. It is the birthplace of the Kievan Rus, the original Slavic culture that Russians trace their own culture back to. It is home to about 10 million ethnic Russians, roughly 20 percent of the entire population there, shares hundreds of miles of common border with Russia, and provides a historically useful buffer space from European invasions, which seem to occur every so often. It has absorbed Napoleonic and Nazi assaults, massive famine, and the Chernobyl disaster and continues to be one of Russia’s biggest trading partners and the place most Russian gas pipelines to Europe run through. Clearly, Ukraine as a geopolitical prize is epic; it’s the biggest thing one can take from Russia besides Russia itself. It seems a stretch to even attempt such a move, but apparently the successes of Belgrade and Tbilisi had left some people feeling very cocky. Ian was appointed shortly after 9/11 to be the Pentagon’s representative to its European NATO partners and a pivotal part of the decision of who will join next. 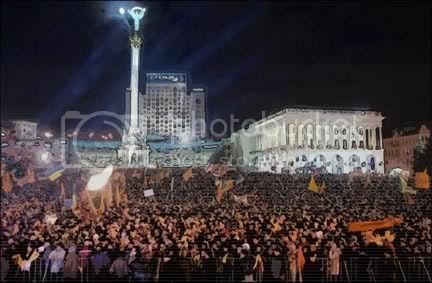 But his hopes of internal reform started to seem less likely as 2004 dawned with President Kuchma and the PM set to take his place disinterested in such changes and steadily gravitating to the East and Moscow’s sphere. This is where Viktor Yushchenko, Pora!, dioxin, and the Orange Revolution come in. 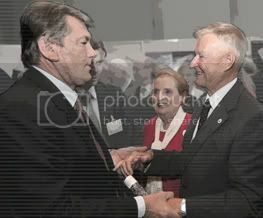 On a working visit to Poland at the end of August, a still faintly scarred Yushchenko had a photo taken with Ian and Mark’s father, the exalted Zbigniew Brzezinski in the land of his birth. They clasped hands and gazed smilingly at each other as NDI’s Madeleine Albright looked on with a grin. The “democratic bridgehead” had been extended as Zbig had prescribed eight years earlier, and he seemed very happy about the whole affair. The decade-running family project had yielded tangible gains, but the situtaion would soon complicate and the smiles would fade.